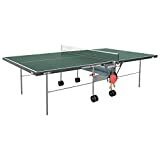 The Butterfly Table Tennis Table Cover provides maximum protection with weatherproof materials. 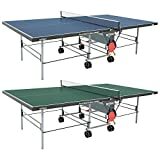 This simple high quality table tennis table cover protects your table from dirt and debris. When used on an outdoor table, the cover protects from harmful elements, such as rain and snow. The cover protects your ping pong table in dual modes. 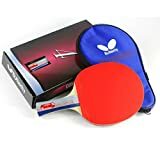 The cover can be used to protect your ping pong table in the storage position and play position. It covers easily over the net in the play position. Unlike many table tennis table covers on the market, this cover is made of high quality material. 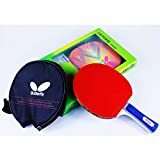 The Butterfly Table Tennis Table Cover is made of weatherproof nylon and not cheap PVC (tarp material). It contains a unique handle allows you to remove the cover very quickly for a quick set up. This handle on the top of the cover allows you to hang when not in use to avoid dirt and debris. Zippers on both sides make securing and opening a breeze. 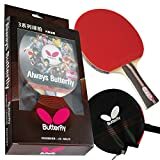 The Butterfly Table Tennis Cover fits all Butterfly table tennis tables and most tables on the market. Measures L 60 1/2" X W 29 1/2" X H 59".